TERRE HAUTE, Ind. - The Jamey Aebersold Quartet will perform at 7:30 p.m. March 3 in Indiana State University's Center for Performing and Fine Art Recital Hall, 301 N. Seventh Street. Aebersold, a nationally-known saxophonist and authority on jazz education and improvisation, will be on the Indiana State campus conducting master classes from 2-6pm in room 159 of the Center for Performing and Fine Arts. The concert and classes are free and open to the public. Aebersold has developed a series of Aebersold play-a-longs book and recording sets (now numbering more than 113 volumes) as well as various other supplemental aids for the development of improvisational skills. The Aebersold book and recording sets allow a musician the opportunity to practice and improvise with well-known jazz personalities at home as well as in the classroom. The recordings employ some of the best jazz musicians in the world. This concept has been responsible for changing the practice habits of thousands of musicians around the world. He was a pioneer in encouraging small group classes which concentrate on jazz improvisation, and he is the director of the Summer Jazz Workshops. 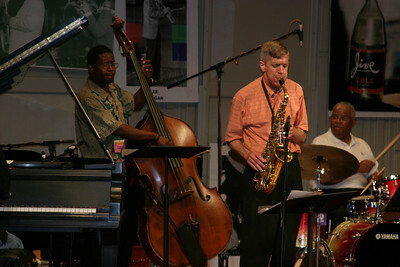 A native of New Albany, Aebersold attended Indiana University and graduated in 1962 with a master's degree in saxophone. He was awarded an honorary Doctorate of Music by Indiana University in 1992. He also plays piano, bass and banjo. For more information on the concert, contact the ISU music department at 812-237-2771. The Jamey Aebersold Quartet will perform at 7:30 p.m. March 3 in Indiana State University's Center for Performing and Fine Art Recital Hall, 301 N. Seventh Street.